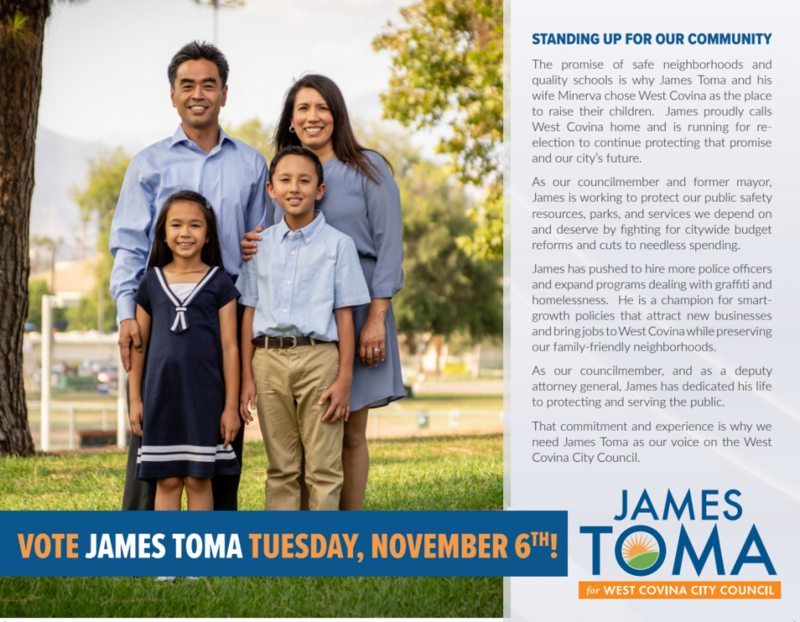 James Toma and his wife, Minerva, chose West Covina as the place to raise their two young children for the promise of safe neighborhoods and good schools. Their two children currently attend schools in West Covina. Growing up James attended seven public schools and did not plan to go to college until late in high school. Despite his late start, his academic achievements led him to ultimately be accepted to Yale University. To make ends meet, he worked as a dishwasher, newspaper deliverer, custodian, and dining hall worker. He graduated from Yale in 1992 with a bachelor’s degree in Ethics, Politics, and Economics. 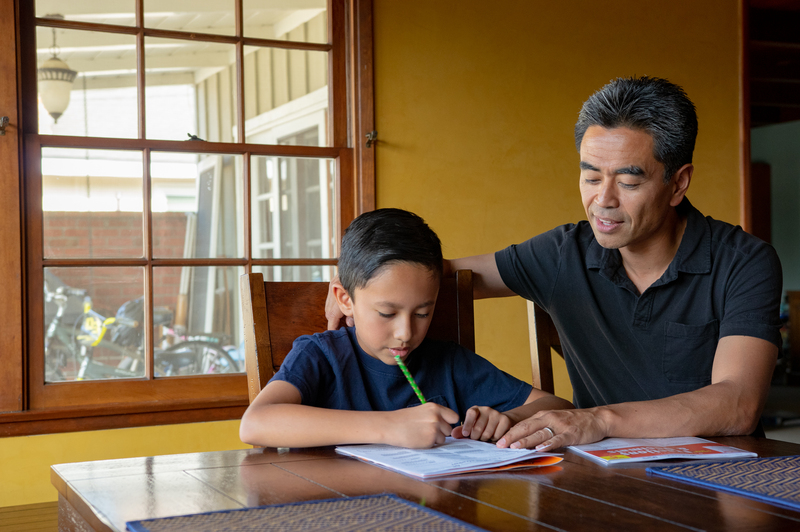 After becoming the first college graduate in his family, James went on to earn a master’s degree in public policy from the University of California, Berkeley. He served as a legislative aide in the state capitol and successfully shepherded legislation into law to toughen penalties for elder abuse. James also served as a consultant to the Assembly Public Safety Committee, where he analyzed criminal justice legislation and organized statewide hearings on high technology crime and elder abuse. After his time in Sacramento, James returned to the University of California, Berkeley, where he earned his law degree. 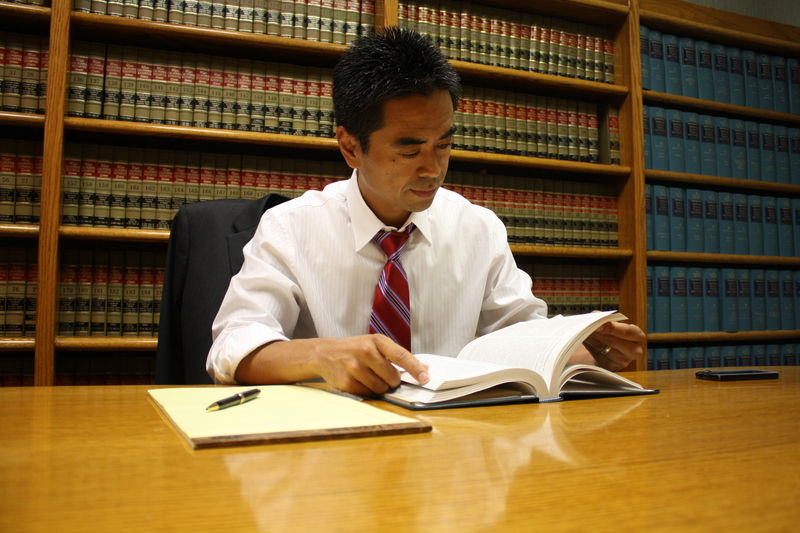 Early in his legal career, James worked at a full service law firm where he practiced business litigation. James currently serves the public as a Deputy Attorney General in the Office of the Attorney General, California Department of Justice where he works on charitable fraud issues. James is an active member of several organizations. 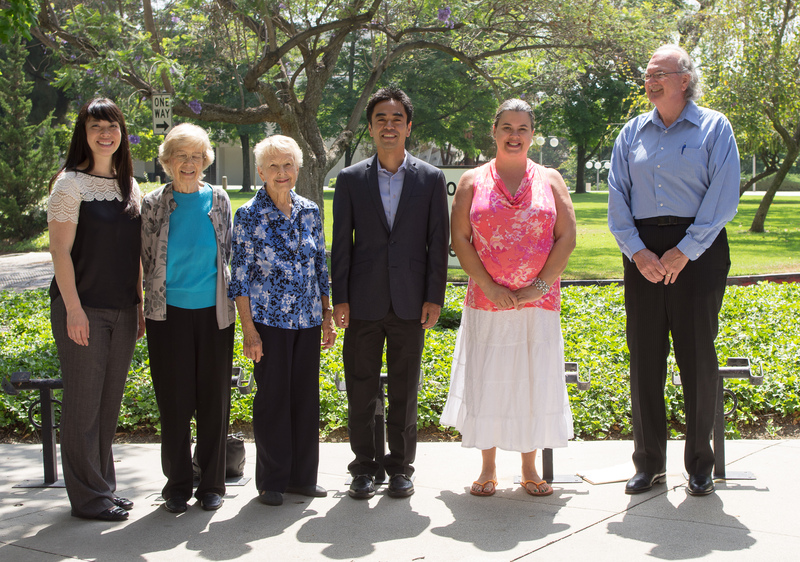 He has served as President of the Friends of the West Covina Library and the Japanese American Bar Association (JABA). He has previously served on the Executive Committee for the Los Angeles County Bar Association (LACBA) Litigation Section. James’ parents taught him the importance of contributing to the community. 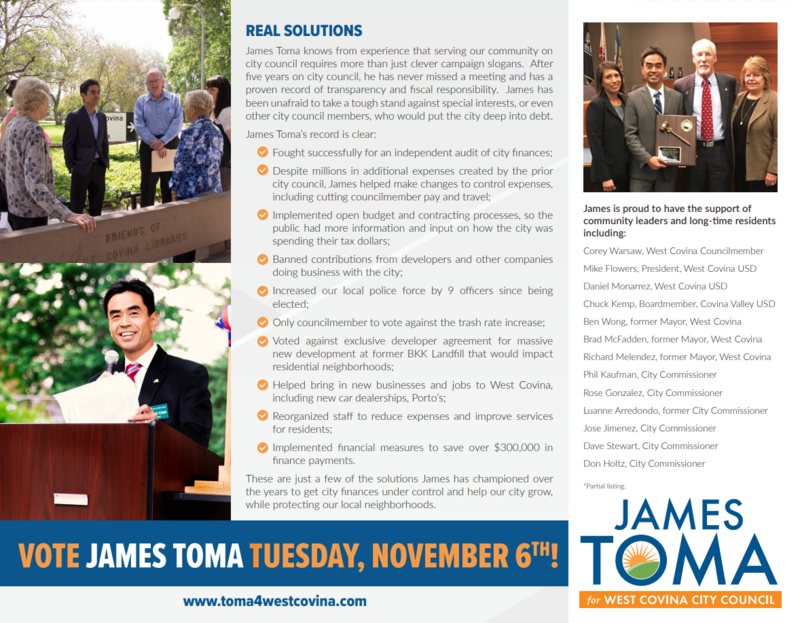 James has long believed that working to improve the lives of others is the most important work that can be done. He has worked with poor, immigrant families in Los Angeles Skid Row, volunteered as a Big Brother, and recruited students of color from urban high schools for his alma mater. He has volunteered at food banks, toy drives, and raised money for Alzheimer’s and cancer research. 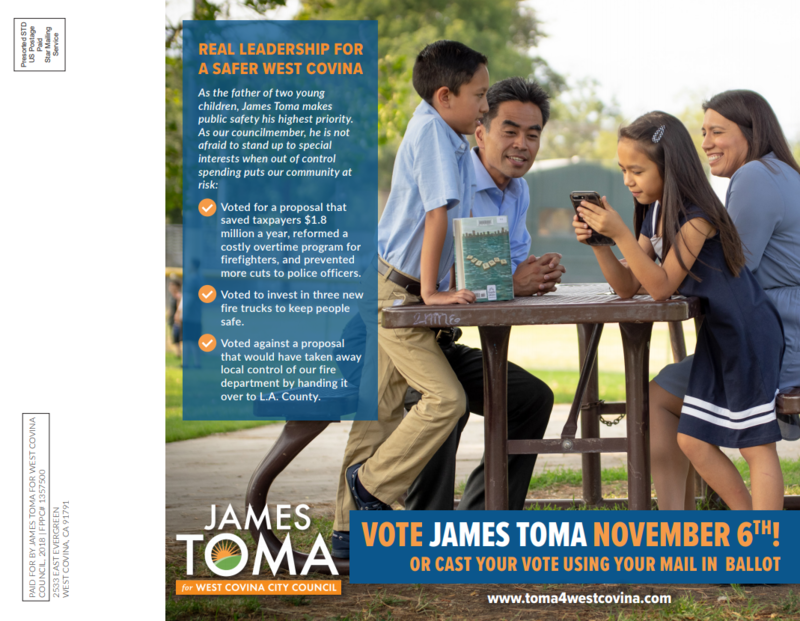 When not spending time with his family, volunteering, attending West Covina events, or working, he enjoys running, reading, and following local sports teams. 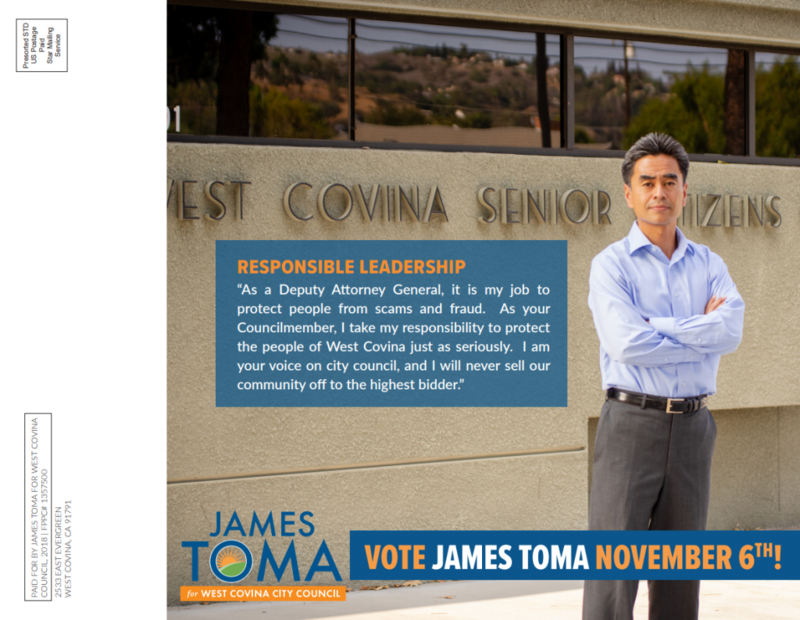 James was first elected to the West Covina City Council on November 5, 2013. He had the honor of being the top vote getter in that election. He served as Mayor in 2016. As a Deputy Attorney General with California’s Department of Justice who works everyday protecting people from fraud, James knows the importance of transparency. He believes the business of our City Council should be the people they represent. That is why he has never taken money from developers and voted to pass a law prohibiting contributions from developers or other special interests . 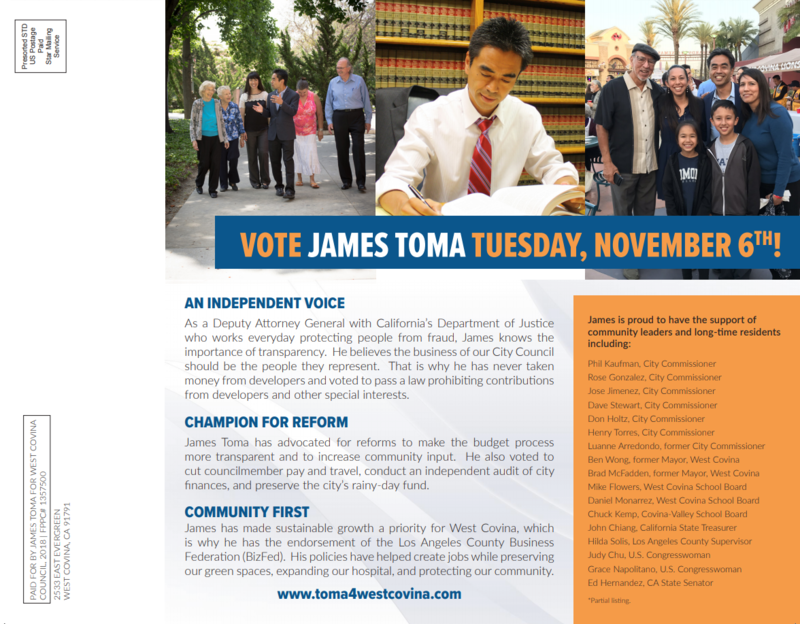 James Toma has advocated for reforms to make the budget process more transparent and to increase community input. He also voted to cut Councilmember pay and travel, conduct an independent audit of city finances, and preserve the city’s rainy-day fund. 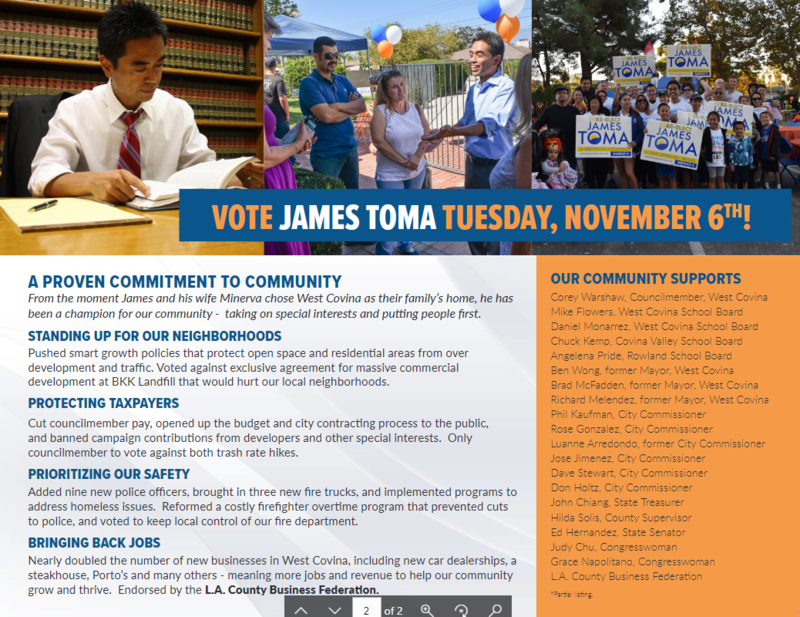 The West Covina Improvement Association (WCIA) sponsored a District 4 Candidates Forum at City Hall on September 26, 2018. Below are the questions that were submitted by residents and asked by the moderator, Dr. David Speak. 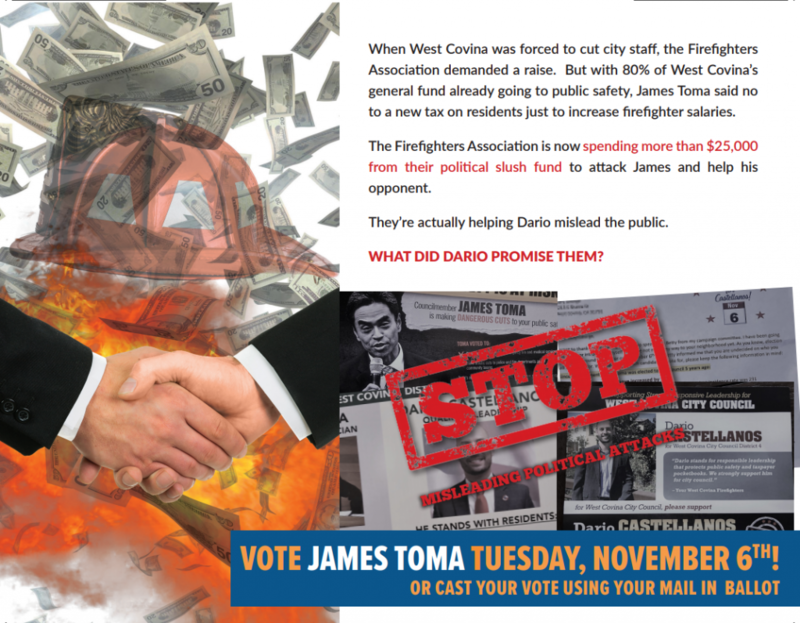 Please click on the links to view James Toma’s responses, as well as those of his opponent. The candidates first introduced themselves with their opening statements. The forum concluded with the candidates’ closing statements.